Combine gravy mixes, flour, salt and pepper in large bowl. 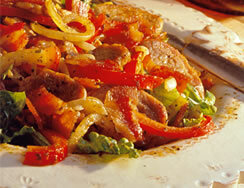 Add vegetables to bowl; toss to coat well. Remove vegetables from flour mixture and place in 5 to 6-quart slow cooker. Add beef roast to bowl, turning to coat evenly with flour mixture. 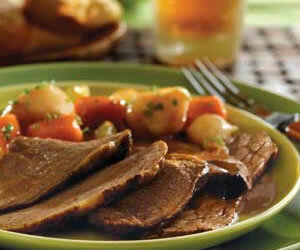 Remove roast and place in slow cooker in center of vegetables. Remove roast and vegetables. Skim fat from gravy. Carve roast into thin slices. Serve with vegetables and gravy. Sprinkle with parsley, if desired.